Millions of people die each year from HIV/AIDS-related illnesses – 2/3 of them in Sub-Saharan Africa – despite medical and diagnostic advances. Accessible, flexible and high-quality testing is essential to help limit the spread of the disease and better manage HIV infection for improved prognosis and quality of life. On the frontlines against HIV from the beginning, bioMérieux is dedicated to making our best-in-class HIV solutions accessible and available to all, for better patient care everywhere. First identified in the 1980s, the human immunodeficiency virus (HIV), a lentivirus that targets white blood cells vital to the human immune system,1 has become a challenge of global proportions. It is transmitted through body fluids – most commonly through unprotected sexual contact. If left untreated, it leads to acquired immunodeficiency syndrome (AIDS) and ultimately death. Medical advances have led to dramatically improved quality of life and prognosis for people living with HIV, although there is still no effective vaccine or cure. Good management of HIV is done through early detection and initiation of antiretroviral treatment (ART), along with ongoing screening to ensure the best-adapted therapies. However, access to these possibilities is not available equally to all people. That’s why expert organizations, such as the WHO and the CDC, place a strategic focus on making HIV education, testing, screening and therapies accessible to all, in order to reduce the numbers of new HIV infections and improve quality of life for those living with the disease around the world. "Optimize HIV prevention, diagnosis, treatment and care outcomes"
bioMérieux developed one of the very first HIV screening tests available in 1985, not long after the discovery of the virus. We have continued to innovate ever since and today we have one of the widest product offers available for diagnosis and monitoring of HIV. Our goal is to make flexible, high quality HIV testing and screening solutions accessible to everyone, in all types of healthcare settings and systems. Every HIV assay, platform and service we offer is designed to be high-quality and to contribute to improved patient outcomes. For diagnostic testing, we offer ultra-sensitive combined 4th generation ELISA (enzyme-linked immunosorbent assay) and Advanced 4th generation tests. These tests simultaneously detect HIV antibodies and the HIV1 p24 antigen, enable effective detection earlier than antibody-only tests.2 Our VIDAS® HIV DUO ULTRA and VIDAS® HIV DUO Quick tests detect HIV during primary infection (within 1-3 weeks), even before production of antibodies. Early diagnosis means being able to begin appropriate care faster. Antiretroviral treatments (ART) keep viral load down, lower the risk of transmission3,4 and lower the chance of developing AIDS2. Monitoring the effectiveness of ART ensures patients can benefit from enhanced quality of life through well-adapted therapy and rapid detection of resistance to treatment. 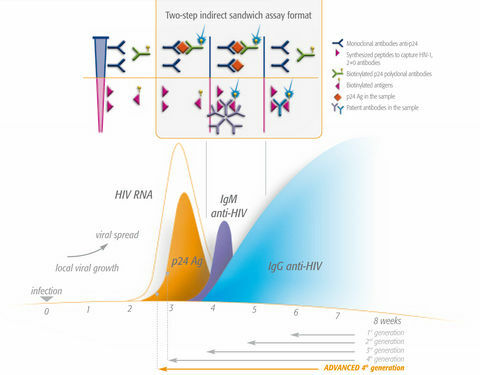 bioMérieux’s NucliSENS EasyQ® HIV-1 v2.0 offers reliable and sensitive real-time detection thanks to Nucleic Acid Sequence-Based-Amplification (NASBA) technology and molecular beacons. The easy to use VIDAS® HIV DUO tests offer excellent analytical sensitivity, low limit of detection of HIV infection and high p24 Ag sensitivity*. *SOURCES: Ly TD, et al. 2007 Jul;143(1):86-94. Epub 2007, Mar 28. Accessibility to HIV diagnosis, treatment and monitoring is considered a vital strategy in fighting the disease worldwide3,4, and bioMérieux designs solutions towards this end. We offer solutions that are affordable, simple and flexible to suit different lab situations around the world. Point-of-care rapid tests help make screening more accessible, so more people are tested earlier. This is particularly important in low-resource countries and among marginalized or high-risk populations. The affordable and easy-to-use VIKIA® HIV 1/2 offers sensitive (whole blood: 99.86%) and specific (whole blood: 99.95%) results in 30 minutes. A high-quality 3rd generation test, it can be used anywhere: no water or electricity is needed and the tests, in sealed individual packs, remain stable between 4 and 30°C. VIKIA® HIV1/2 is pre-qualified by the WHO. 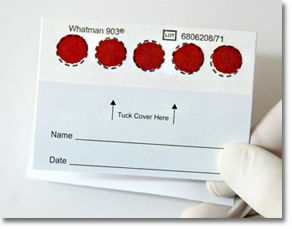 Dry Blood Spot (DBS) offers a simple, economical way to collect and transport samples with a few drops of whole blood absorbed onto filter paper. Samples can be collected outside the lab, even in remote areas and any climate, and then brought for centralized testing. Fighting HIV/AIDS requires a collaborative approach at the community, country and global level. At bioMérieux, we are committed to contributing to this approach through research, development, education, and social responsibility. Our long experience at the forefront of the HIV/AIDS epidemic and our expertise in microbiology ensure we meet the needs of those providing frontline care as well as of public health bodies and NGOs engaged in the issue. That’s why we build a global offer that’s high-quality and takes into account the multiple facets of optimal prevention and care. We aim for flexibilty in our offer because we believe everyone has the right to HIV education, diagnosis and quality care. We are also aware that HIV/AIDS is inextricably linked to the other diseases that it leaves patients vulnerable to. Other bioMérieux product lines target – among others – viral/bacterial/fungal infections, hepatitis, tuberculosis and malaria. In your daily combat against HIV/AIDS, you can count on bioMérieux as your long-term partner, providing quality diagnostic and screening tests to support optimal care worldwide. A solução contém os produtos abaixo. Clique nos produtos para ver os detalhes.